We had two buses, one large and one small. I drew the small straw and got to be the Bus Captain on the smaller vehicle, but at least I had a nice view of the countryside as we headed across the continent. ###Day One The first day was probably our longest one. We took off from Airport West at 8am and were headed to Port Augusta a 1,100km to the west. We headed out and made our first stop in Bendigo where we picked up Jess. From there, straight on to Mildura for lunch and picking up more people. By this time it was pretty late, and it was obvious that we had a long night ahead of us. We trekked on, heading west and eventually we pulled over in a little town, taking over the picnic shelter by an old railway station for a late BBQ dinner. Tam also took the opportunity of finding a bit of reception to call ahead to Port Augusta, where we were staying at the Scout Hall. The Group Leader was quite surprised by our call as we had already arrived. Turns out that there was a group of NSW Rovers staying there that night and the Group just assumed that we were the same group. 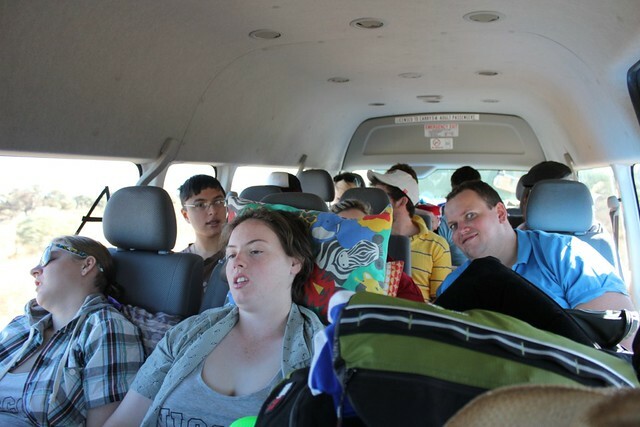 We finished dinner and were soon on the road again, pulling into Port Augusta late a night. Our New South Friends weren’t impressed by this, as those who were staying inside the hall were apparently quite noisy about it. I wouldn’t know, because I was amongst the group who were swagging it in what we would see the next morning was actually an impressively large backyard. ###Day Two Day two was Golf Day. 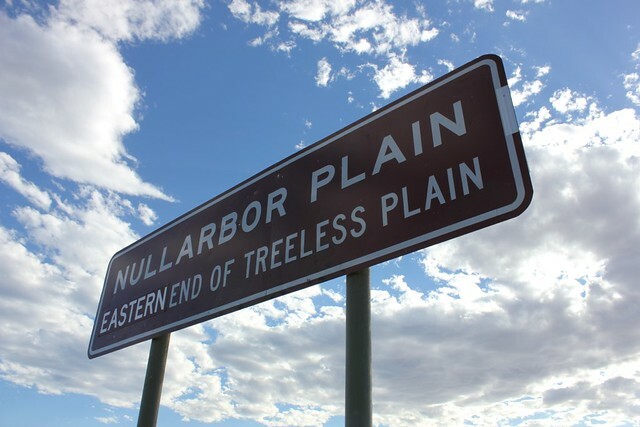 Turns out that the Nullarbor is home to the world’s longest golf course so we had planned to dress the part and stop at several of the 18 towns that were a part of the course. Of course, we had learnt yesterday after about 15 hours of travelling that as a group we weren’t to be trusted with frequent stops, because spending half the day not moving is not how road trips work. We were headed from Port Augusta all the way to Eucla today, just across the border into Western Australia. Again we took off early, and soon we were at the Big Galah — because every country town needs a tourist trap we obediently had our picture there before heading on to the town of Ceduna for lunch. There we discovered something that would be a repeating theme for our journey: it’s a big struggle to get yourselves fed in outback towns between Christmas and New Year’s. 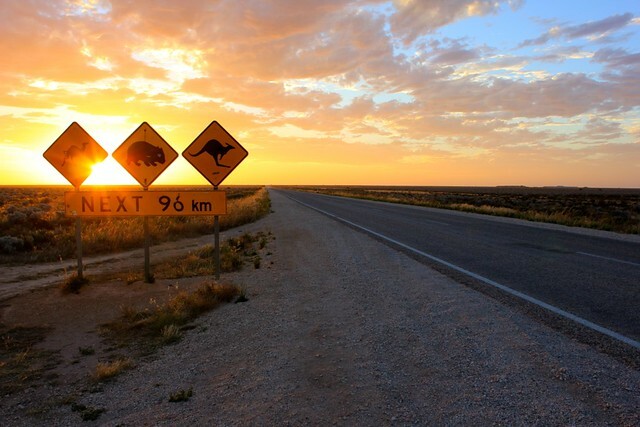 ####The Nullarbor The chance to cross the Nullarbor was a key reason why I joined the road trip instead of flying like any sensible person. I’d been looking forward to it ever since driving up the Stuart Highway in high school, and here we were at last. Since this was summer, it was road-meltingly hot probably about 50 degrees and the aircon in our larger bus wasn’t up to that challenge. So in the late afternoon, things started getting really hot in that bus. We tried swapping around a bit so that people who were struggling could cool down, but it didn’t work too well. There were a lot of photos taken today, mostly in front of the sign saying “nullarbor plain. It’s a straight road” but also when we stopped for dinner at the roadhouse, I and many other keen photographers were out wandering the desert being arty and what not. It was good fun. After dinner, it was back onto the bus, although at least since it was a desert, the temperatures came down. We arrived at Eucla very late. Sunset in the desert. So cool. We also left Eucla very early. A few hours later, we stopped to fuel up and I was one of the smart people who took this opportunity to invest in a bacon and egg sandwich — something which always pays off for the hungry investor. Sunset in the desert Heading back to the buses though, it was pointed out to me that it was Priscilla, Queen of the Desert Day, and I wasn’t cross-dressing nearly enough. Tini was kind enough to lend me one of her dresses, however Tini is a short girl of Greek descent, and I am a very tall, very thin guy so it was a nice pastel singlet for me to wear. Someone else lent me a tasteful sarong though, so at least I fitted in in the not fitting in stakes as we made our way through the depths of outback Western Australia. The louder, more outgoing members of the roadtrip had been exiled from the main vehicle for the day — although they didn’t put up much of a fight. Much fun was had as we passed one another by people who were out to out-ridiculous each other. This was also the day that we got a call from our Contingent Advisor, who had spoken earlier with an Advisor from SA who was driving over to the Moot… apparently he called up to complain about the driving habits of Victorian Rovers on the highways — we weren’t going nearly fast enough! After we left Caiguna though, things got hectic. Freed of the tyranny of the guys who were travelling with me, they went pretty wild themselves. A previously mentioned small greek girl consumed far more goon than was a good idea, for example. 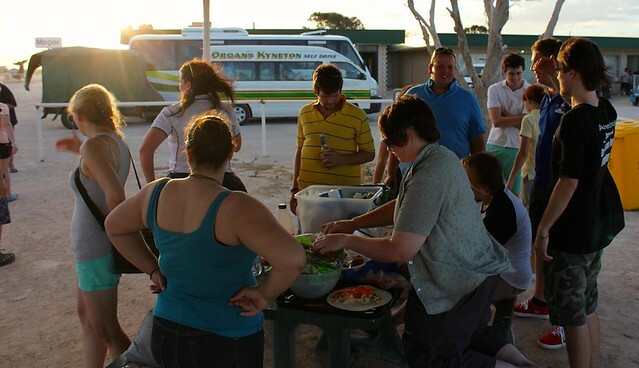 But we made it to our next campsite at Esperance in time for a tour of the town and more importantly, in time for a dinner of Fish & Chips. Day Four was “tight and bright day” … although it appears that no one told PJ. We kicked off the day with a trip to the beach, before hitting up the nearby salt flat and then heading on to Albany. I rode on the large bus for the day which was a nice change. There are many pictures of people wearing clothes which are both very tight and very bright in my flickr album — Nikki’s outfit was from her childhood gymnastics and I was quite concerned about what was going to happen to it if she were to sneeze but apparently she made it through the day without wardrobe malfunction. ###Day Five Our last day was an express run from Albany to the Moot Site at Woodmans Point. Our only stop offs were at the old whaling station in Albany, and then for lunch and a couple of other necessities — we figured out that we were running late and they actually had to push back the opening ceremony so that we didn’t miss it. Opps!